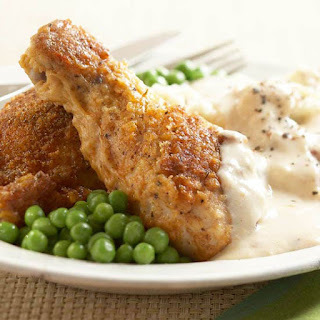 Recipe Source Online: How about a little Fried Chicken Maryland Style with Gravy? How about a little Fried Chicken Maryland Style with Gravy? In a small bowl combine the egg and the 3 tablespoons milk. In a shallow bowl combine crushed crackers, thyme, paprika, and pepper. Dip chicken pieces, 1 at a time, in egg mixture; roll in cracker mixture. In a large skillet brown chicken in hot oil over medium heat for 10 to 15 minutes, turning occasionally. Drain well. Add the 1 cup milk to skillet. Heat just to boiling. Reduce heat to medium-low; cover tightly. Cook for 35 minutes. Uncover; cook about 10 minutes more or until chicken is no longer pink (170 degrees F for breasts; 180 degrees F for thighs and drumsticks). Transfer chicken to a serving platter, reserving drippings for gravy. Cover chicken and keep warm. Prepare Creamy Gravy. Makes 6 servings.